Using RF-/STEEL EC3, you can apply nominal temperature‑time curves in RFEM or RSTAB. For this, the standard time‑temperature curve (ETK), the external fire curve and the hydrocarbon fire curve are implemented in the program. 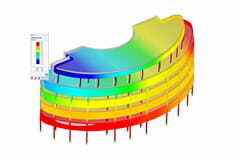 Based on these temperature curves, the add‑on module can calculate the temperature in the steel cross‑section and thus perform the fire design using the determined temperatures. 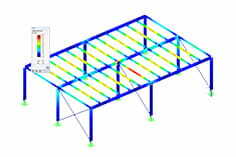 This article explains the thermal behaviour of structural steel as this is a direct impact on the calculation of component temperatures in RF‑/STEEL EC3. 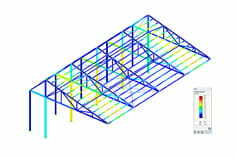 The material properties of structural steel are described in EN 1993‑1‑2  by using functions in order to have an accurate value for each property at each temperature. The thermal expansion Δl/l is a change in geometrical dimensions caused by the temperature change. The specific heat capacity ca in J/(kgK) is the heat amount required to heat one kilogram of material by one Kelvin. The thermal conductivity λa in W/(mK) describes the ability to transfer heat energy by means of heat transfer.